One of my favorite things to do on vacation is cook for friends and family (...big surprise). On our recent trip to Palm Springs, I had the chance to cook and bake a few different times (you've already seen my pièce de résistance). I made this salad to accompany a family barbecue feast, and it was devoured by all, even my salad-wary dad (he especially liked the feta). This salad was quite similar to the Green Bean, Corn, and Tomato Salad with Shallot Vinaigrette that I made earlier this summer, and I can't quite decide which one I like better. Can I take the easy way out and say both?! 1. Cook barley in medium saucepan of boiling salted water until tender, about 30 to 40 minutes. Drain; cool. Transfer to large bowl. 2. Cook green beans in large pot of boiling salted water until crisp-tender, about 3 minutes. Drain. Transfer beans to bowl of ice water to cool. Drain well. Transfer to bowl with barley. Mix in corn kernels. Washed and dry arugula; add to bowl with barley mixture. 3. Whisk olive oil, vinegar, shallots, thyme and Dijon mustard in small bowl to blend. Pour dressing over barley mixture to coat. 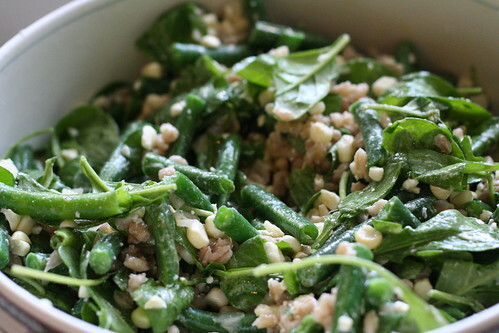 Season salad to taste with salt and pepper. Sprinkle with feta and serve. I just wanted to tell you that I made two of your recipes this week: the shrimp and artichoke dish and the broccoli and breadcrumbs pasta- well, I ruined the first one because I forgot that my shrimp was pre-cooked, and I cooked it for 12 minutes. Oops! But the second one was GREAT! I can't wait to try some more! Great twist on a bean salad. Super idea. Thanks for the note on my site even if you didn't cook along with CEimB this week. I love the beautiful green colors of this salad! Great way to combine all these ingredients too! This looks like an incredible salad! And what a lovely photo. Thank you for posting!